2. What is protected conduct? 3. Did your employer take adverse action? 4. Did your employer know about your protected conduct? 5. What is the evidence that your protected conduct led to your termination? 6. How can I counter my employer’s denials? 7. Who enforces the law? 8. What are the remedies available to me? 9. If I lose my discrimination claim can I still win my retaliation claim? 10. How can I file a complaint / How long do I have to file? Most of the federal laws that protect employees’ rights contain provisions that make it unlawful for an employer to retaliate against someone who engages in conduct which the law protects. Proving retaliation can be difficult. The following are key questions to be asked in considering a claim for retaliation. “Protected conduct” includes all aspects of trying to oppose or remedy discrimination, such as: filing a charge of discrimination; threatening to file a charge; complaining about, opposing or protesting perceived discrimination against yourself or another employee; assisting someone else in opposing discrimination; giving evidence or testimony to an investigator; refusing to engage in conduct that the you believe to be unlawful; and refusing to assist an employer (by testimony or otherwise) in discriminating. For example, in a case against Day & Zimmerman NPS, Inc (“DZNPS”), the court held that (1) revealing an employee’s charge of discrimination to the employee’s colleagues was an adverse employment action and that the court may look at the time frame between the filed discrimination claim and (2) employer’s alleged retaliatory action to determine that an adverse action taken against an employee was a result of a discrimination charge filed. No resulting harm in an adverse action needs to be proven. For a retaliation claim to exist, the EEOC needs to prove that the adverse action could dissuade employees from making a charge of their own or communicating with the EEOC in general. This case urges employers to be careful with what information is disclosed to their employees. Under the Family and Medical Leave Act (FMLA), requesting or taking medical leave or protesting your employer’s refusal to allow you to take leave is considered protected conduct. Even making inquiries about a certain policy or practice of the company, or about your participation in any retirement or other plan covered by the Employee Retirement Income and Security Act (ERISA), is protected conduct. Other employment statutes also have anti-retaliation clauses. Your employer must have retaliated against you in some way that is “materially adverse” and likely to “dissuade a reasonable worker from making or supporting a charge of discrimination” for the conduct to be considered unlawful. Usually, unlawful retaliation takes the form of demotion, harassment or termination, but as a result of a recent Supreme Court decision, does not have to be confined to employment or occur at the workplace, if it is enough that a reasonable person would be less likely to complain about discrimination as a result. You must show that your employer knew that you engaged in protected conduct. This requires that the person who makes the actual decision about your job, either verbally or in writing, knew about your conduct. Telling the decision maker about your conduct is the simplest way to assure that the employer knows about you protected activity. However, there are other ways that the decision maker could have learned about your conduct. Other company employees or supervisors or the Equal Employment Opportunity Commission may tell someone at your company about your protected conduct. If you cannot prove that your employer knew about your protected conduct, you will not be able to prove a case of retaliation. The most difficult part of a retaliation claim is showing a causal connection between your protected conduct and the adverse action taken against you. Timing can be evidence of a causal connection. If your employer fires you shortly after you file a charge of discrimination, one can infer that your protected conduct was the real reason for your termination. A recent Supreme Court decision held that retaliation claims must be proved according to a ‘but- for- causation’ standard. This means that you must show that the retaliation would not have occurred if you had not engaged in the protected activity, like filing a charge of discrimination. For example, if your employer claims that you were terminated for some specific misconduct, you could show that you didn’t engage in the alleged misconduct at all and therefore your discrimination charge is the only possible reason for your termination. The type of evidence you have and the amount of evidence you have against your employer can help you meet this but-for standard. You can disprove your employer’s stated reasons for your termination using the same kind of evidence used to show “pretext” in a discrimination case. For example, you can show that the employer’s excuse is factually untrue, that it was insufficient to have actually caused your discharge, that it is simply unworthy of credence, or so riddled with errors that your employer could not realistically have relied on its stated reason. Remember, it is always going to be up to you, the employee, to prove unlawful motivation. While difficult, it is not impossible. Circumstantial evidence can be powerful in proving your case. The Equal Employment Opportunity Commission (EEOC) is the federal governmental agency responsible for investigating charges of retaliation on the basis of protected conduct in workplaces of 20 or more employees. Most states have their own agencies that enforce state laws against retaliation (see question 9 below). other actions that will make an individual “whole” (in the condition she or he would have been but for the discrimination or retaliation). The employer also may be required to take corrective or preventive actions to cure the source of the identified discrimination and minimize the chance of its recurrence, as well as discontinue the specific discriminatory practices involved in the case. Your state law may allow for greater or different remedies than federal law. Yes. Retaliation claims are separate from discrimination claims, and the success of one is not dependent on the other. Courts often times find that an employee has suffered from retaliation absent from finding that the protected activity was based on discrimination. You can win your retaliation claim by showing that after you filed your discrimination claim you suffered an adverse action due to the filing of your compliant. If it is found that no discrimination has occurred, you can still get relief for your retaliation claim. Employees can also bring retaliation claims for participating in or testifying on behalf of another employee in their discrimination case. In a situation like this, the employee’s retaliation claim is completely separate from their co-employees’ discrimination claim. Retaliation for filing discrimination claims or making discrimination complaints is prohibited by the same laws which prohibit discrimination itself. Complaints of retaliation are processed by the same state agencies following the same process as the underlying discrimination claim. 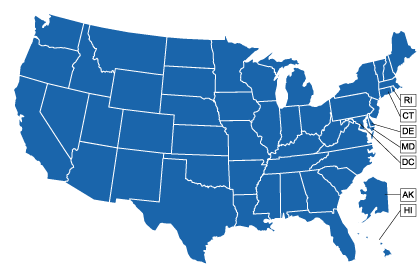 Select your state from the map below or from this list to find out more about how to file a discrimination or a retaliation claim.